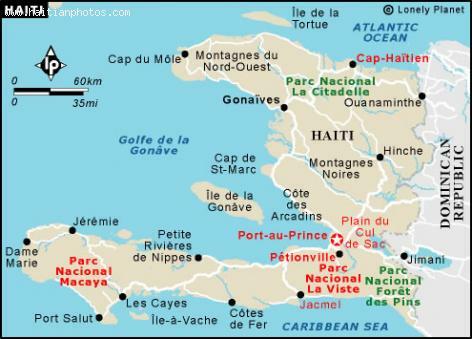 Located on the western side of the Hispaniola Island, Haiti is right in the heart of the Arcadian coast or the Cotes-des-Arcadins. The coast is made of long beaches of white sands and is considered among the most beautiful beaches in the world. It is a perfect hideout for tourists who want to spend some time in the lap of natural beauty that looks surreal and those who love fishing and sailing. Cotes-des-Arcadins is known for its three exotic beaches that provide a very pleasing climate and beautiful scenic beauty in Caribbean region. Cotes-des-Arcadins is also the home for a beautiful and extensive coral reef that has attracted tourists for years but today, the fate of the reef looks glooming and dead because of excessive fishing in the area. Located in the heart of Cotes-des-Arcadins is the Montrouis - a coastal town. It is Haiti's most popular tourist spot with a number of resorts and hotels that definitely convert Montrouis in a paradise for vacationers. The beach line stretches up to 15 kilometers housing over 6 world-class hotels. President Michel Martelly met the tourism industry stakeholders in Cotes-des-Arcadins. This meeting was aimed towards fostering collaboration between the stakeholders and the government to improve the industry of tourism in Haiti because this industry is the untapped economic resource that can actually help Haiti to get out of its poverty. In return to this plea, the President met with some grievances like rubble and garbage dumping in the region, illegal constructions and insurmountable traffic because of bad roads. Both parties decided to work together on improving infrastructure for communication and transport, preservation of Montrouis' bio-diversity along with other aspects that can help the tourism industry to grow in Montrouis.